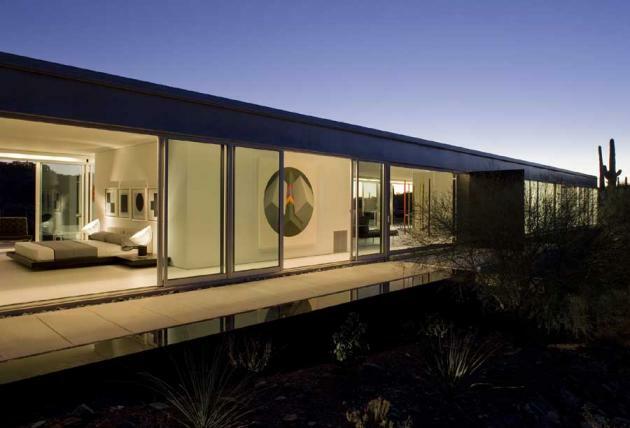 Located in the rural desert town of Cave Creek, Arizona, is the Ellsworth residence, designed by the Michael P. Johnson Design Studio. Visit the Michael P. Johnson Design Studio’s website – here. Read a detailed description after the photos…. 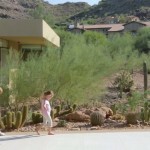 Situated on an east-west axis of a most prized desert real estate (that being an area which sees little building, and as such still retains much of the sentimentality in landscape that is conjured when one thinks of the desert southwest) the Ellsworth Residence, although designed in terms of a modernist predilection does not seem out of place. The sophisticated bareness of materiality, pristine craftsmanship, finely articulated and rigidly geometrical design would make it seem odd to some, especially if placed within a most ruggedly organic landscape; but here, quite the opposite occurs. 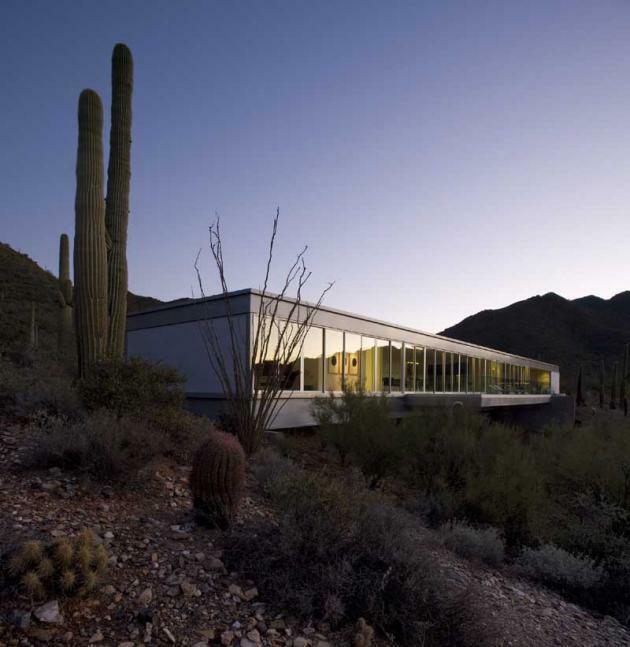 The residence’s clean lines seem almost a continuation of its surroundings; the heaviness of the concrete, glass and steel composition is betrayed by its seemingly weightless appearance, perched, hovering delicately above upon the landscape, and bridging over an 80 foot wide and 30 foot deep naturally formed Arroyo. 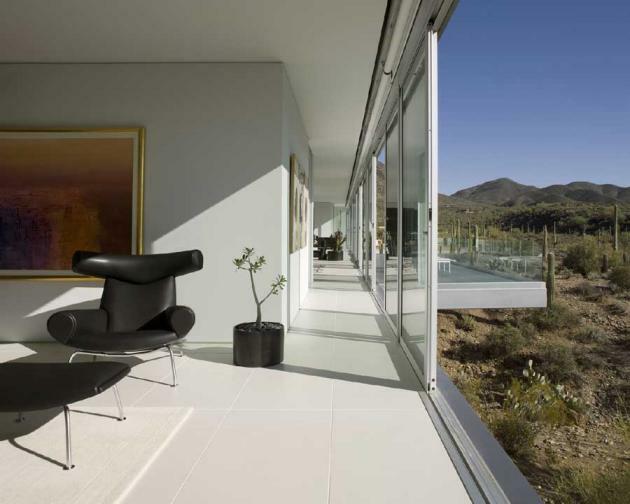 The full length sliding window walls on the north, featuring the main entrance, and south, which extends to a most picturesque desert view, serves to consistently focus ones attention immodestly toward the site and modestly away from the house. An outdoor platform, composed of metal grating, and featured as an extension off of the south side continues this, as it overlooks the considerable drop of the landscape below. The visual permeability of the grating material aids in the residences connection to its surrounds, while giving a sense of uninterrupted views vertically to the Arroyo below. 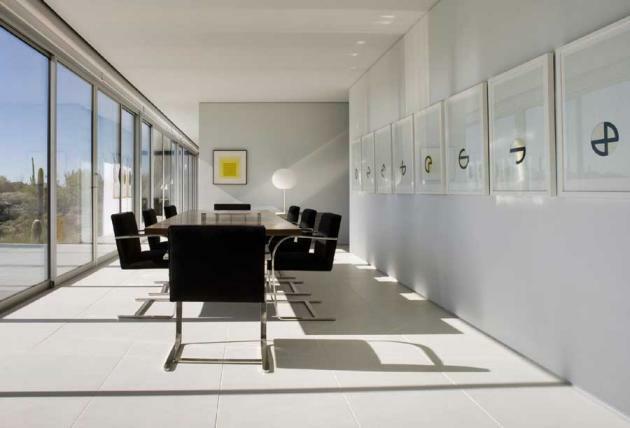 The interiors are equally as impressive; the color palette is kept simple- stark white, muted tones of grey, white Italian porcelain tile matching appropriate décor (the client proved a quick learn and grew an affinity to the modernist style as the architect was asked to furnish a list of appropriate art and furniture styling that would compliment the structure). The master and guest bedrooms and their respective bathrooms anchor either sides of the house while the hearth, featuring the living, dining and kitchen areas are contained in the middle of the plan. 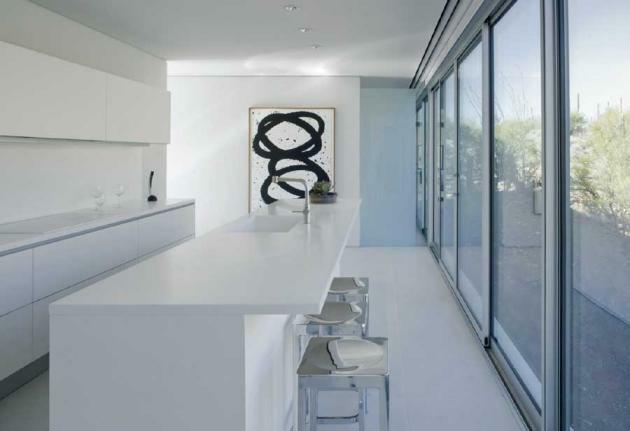 The dining room contains a notable play on structure and aesthetic with a dining room table, and functional yet unassuming steel cabinet both designed by the architect. The dining room table is cantilevered off of a main structural beam on the east west axis of the house; this is articulated via a metal tube protruding from the floor that in turn holds a rather beautifully hewn American Walnut dining table. 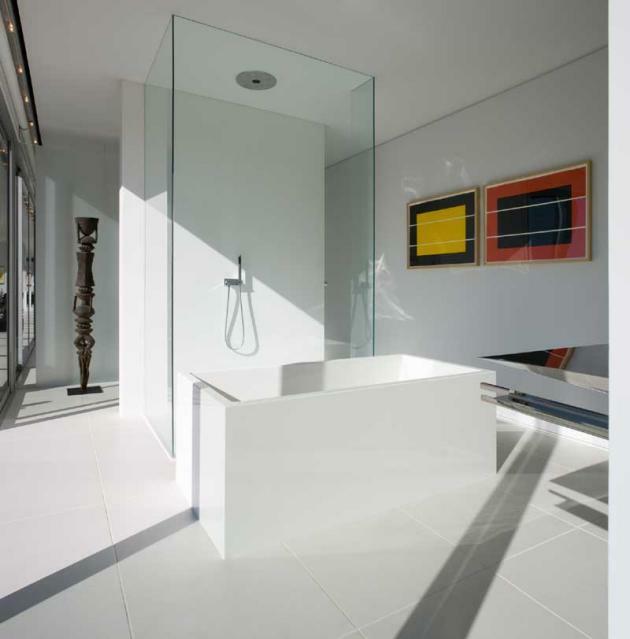 The architect has made clever use of Corian material; showers and bath offer seamless surfaces as the material has eliminated the use of grouts and obvious joints, thus contributing to the overall nature of the design as a singular continuous entity. Joints and joinery of materials (unless intended to show as part of the overall design intent) when obvious can be seen as clumsy detailing on the part of the architect; with Johnson’s careful material choices and detailing this is never the reality in any of his projects. Verona Kitchen by Poliform in stark/snow white along with Poliform closets completes all housing accents. Climate control is seamlessly integrated and hardly noticeable as air diffusers circumscribe the house with fully integrated track lighting, eliminating unsightly air vents and making credible use of space. 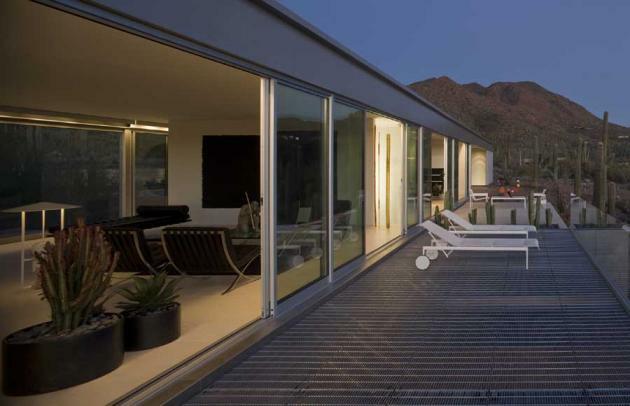 Further, sun control is handled through remote, offering independently operated sun shields with variable settings on both north and south facing sides. 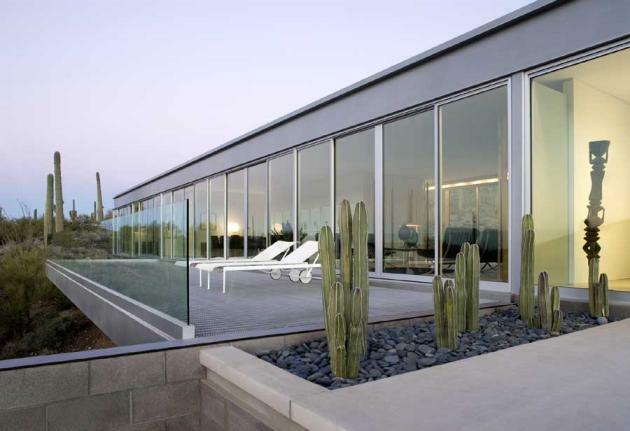 It is difficult to build in the desert, especially if one is using the context of modernism, which makes use of the Glass envelope almost religiously, to do so. However, Johnson’s mastery of material, understanding of the desert context, along with his sensitivity toward the unique possibilities emanating form the fragility of its ecosystems, gives one the sense that modernism is welcome and even belongs here. If our goal is to tread lightly upon a fragile ecosystem, then Johnson’s unique form modernism should remain a welcomed guest in the desert.